1. "Hold the phone, people. I forgot. I'm scared of heights." 2. "Just give me a second, Helen. I KNOW I put the Christmas lights somewhere up here." 3. 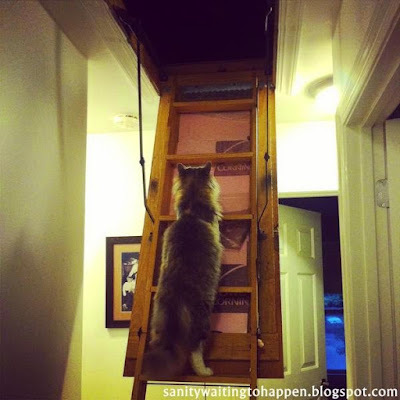 After eight fabulous lives, Tom was finally ready to go toward the light. 4. "Blast the Led Zeppelin, Honey. If this isn't the stairway to heaven, I don't know what is." 5. Tom vowed that this would be the LAST game of "Truth or Dare" he'd ever play with the dog. The man, C., and I were watching a TV show. Something really "saucy" came on and I was uncomfortable. That doesn't happen too often, but still. A few awkward sexual innuendos, an elbow shove from the man, and I blurted out "Hot Pockets." I didn't just say, "Hot Pockets." I sang the words. Like the comedian, Jim Gaffigan. C. and the man started laughing and rolling and none of us could look each other in the eye. It's become our thing. 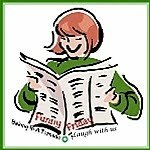 Any topic that's a little inappropriate? Someone sings "Hot Pockets." That's how we deal with the hard stuff, folks. Alex: "Mom, now I understand why you love puzzles. I know you told me not to touch yours, but I couldn't stop! When I put together the border, I felt empowered. There should be background music for that kind of glory." J.: (eyes closed, he holds his finger up to stop me mid-sentence) "Wait...Okay, go ahead. I was singing 'Don't stop Believing' in my head and I had to wait to finish the song." I was helping C. study vocabulary for his Anatomy class. I'd say the word and he would tell me the definition. C.: "It's 'Presbyopia'. That's poor vision caused by aging, mom. Go get your glasses." Alex: "I'm graduating from college!! On May 1st! Feel free to tell everyone you know, including any person you pass on the street, see at Target, meet at Costco or happen to friend on FB." 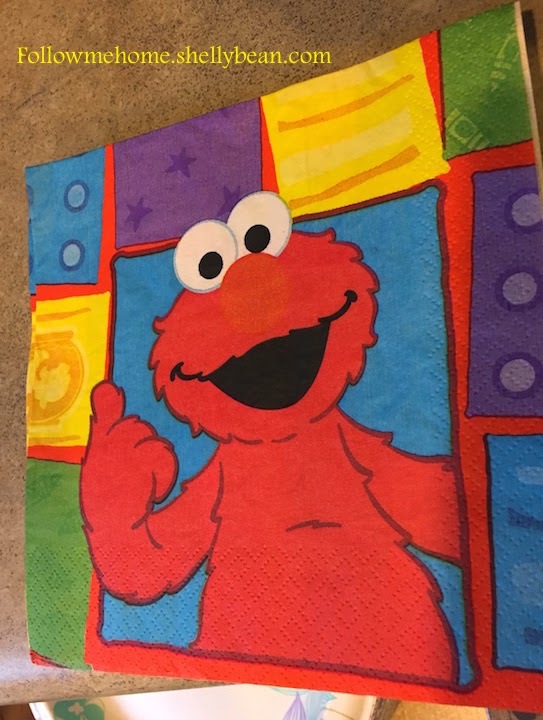 Only two of my three children had Elmo-themed 1st birthdays, which means: These napkins are either ten years old or twenty. Wow. First off, let me say "Thank you" to the big man above for blessing my little part of the world with unusually mild weather. There is no bragging here. After 25 years of living in Michigan and almost twenty years living in Utah, I know snow and cold. And grey and wet. Wind chills, dreariness, and snow days... all of it. Somehow, we've dodged major storms and I couldn't be happier. After I publish this, we will probably have a blizzard of epic proportions. But for now, I'm smiling. Current weather: Sunny and 55. Practically balmy. I get it. I hope dad brings donuts. Superbowl Sunday. Commercials and food galore. One commercial is for the "Little Blue Pill". Great commercial; not kid friendly. J.: "Mom! You need one of those blue pills for your Fiat!" Me: "Nope. I like my car just the way it is." J.: "Come on! It would be so cool. Where can we buy those pills?" The man: "Ask your Grandpa." C. and me: (in unison) "Hot Pockets."